A two-pound bag of Hershey miniature chocolate bars is stowed safely by my mom’s Lazy Boy where she sits during the day and sleeps at night. She says with conviction that she never eats them. But I can see by the shrinking size of the bag that someone certainly does. As mom’s caretaker, I fret over her how she eats. Should I steal the bag? I worry about it. An author friend calls herself a CIO. A few months ago, I adopted this job title for me as well: Chief Inspirational Officer. I suspect it has been my life-long calling–teaching, writing, and caring for others. It works as I navigate mom’s struggles and continue my work with cancer patients, veterans, and writers. Like my writing, this work helps lift me like a kite on a wind-swept beach when I need a boost. Three weeks ago, Mom was ill, and I placed her in hospice. It was a hard decision. A couple of days afterwards I tossed clothes in a suitcase and headed to Tucson to speak at a Survive Well Conference to cancer survivors. I was stressed and underprepared—and that is not my style. But the “parent of a parent” is first and foremost a caretaker. I make mom’s decisions and struggle with my choices. It is the hardest job I have ever had. I love her like a best friend, and I am losing her. A gracious, kind, and caring woman she remembers little about me. As I climbed the steep stairs to the stage at the conference, I wondered if I would trip in the tangle of cords on the floor and somersault forward into the audience like a rock concert routine by Queen. But after years of performing daily for my high school students, my brain is wired to make an easy shift into the joy of speaking. I embrace these moments. And as I looked out over the sea of eyes—six hundred eyes—I was stunned into a moment of silence. These are the eyes of cancer survivors. These are the eyes of courage. And I embraced their shared aura. “Wow!” I began. “Look at you. I feel your courage.” And they did something I did not expect. They applauded wildly. I shared a few stories, but I have forgotten which ones. What I remember vividly is that I had been asked to inspire this crowd, but I parted from these survivors with tears in my eyes. I was uplifted by them. I hugged her, and she smiled again before her eyes fluttered lightly and she slipped back to sleep. As I nibbled a chocolate, I visualized my day. The cancer survivors. My mom, with her wink and her Hershey chocolates. They are true Chief Inspirational Officers. As we wander and sometimes struggle down our paths, perhaps this is a job title we are all trying to hold. I know I am–and perhaps you are, too. The day I moved into the graduate dorm everything changed. I made a new friend. Steve. I wondered why he leaned forward as he shot through the graduate dorm cafeteria toting a huge stack of textbooks. But he had a dream—and he was going after it. I liked that. I also appreciated that he immediately volunteered to fix my vintage Raleigh three speed bike, bequeathed to me by my brother. The day before Noah had accidentally knocked over my Raleigh. The bike seat had been twisted oddly, and I could not ride it. Noah did not apologize. I had just broken a date with him, and he was mad. I would say I had broken up with him, but even after dating for two years, I still did not think of him as a boyfriend. As an undergrad I had trouble finding love. The odds were good at my college: seven guys for every girl, but still—I struggled. Benji, an upperclassman, always wanted to take me to the Pig and Whistle to down a pitcher of beer and shell a couple of pounds of peanuts. Since I was underage and oblivious to false IDs, we usually ended up at the only movie theater in town. Often it was a film, like 2001: A Space Odyssey, that I had already seen a half dozen times. I was relieved when Benji stopped calling. Although I rarely went out with him, Noah seemed to think we were a thing. He had thick-Beatle-styled hair, that you wanted to touch. He walked with a swagger, had a square jaw, and an Adam’s apple that bounced when he talked. My roommate was crazy for him. “He looks like Ashton Kutcher—and oh, that walk!” Noah was headed to vet school. His passions circled around Irish setters and the game of chess. I could not weigh in on either. Instead I longed to talk about the Herman Hesse book I was reading, and Rodney, the nine-year-old I was tutoring at an inner-city Presbyterian church. For two years Noah hung on. Our dates often ended up at his frat house where we would “twist and shout” to the sounds of Fleetwood Mac or the Rolling Stones. I never understood much of what he said as we shouted back and forth over the music and sipped Boone’s Farm Apple Wine from paper cups. At the end of college, many of our friends were marching down the aisle. I began to worry that I might be alone forever, but still, I was relieved to graduate from college—and college frat parties. On the day I moved into the grad dorm, Noah caught sight of me returning from the bookstore with a new book. I had last seen him at a friend’s wedding. “How about dinner at the Pig and Whistle?” he asked. When I turned him down, foolishly explaining I had a new book to read, he stared at me as if I had slapped him. This would be the last time I would ever see him, and in his haste to leave, he turned and collided with my Raleigh, crashing it over. In that moment my understanding of love suddenly shifted. I had a deeper sense of what love might be, and I knew Noah and I weren’t in love and never would be. Maybe I had liked the security of having him around and he was cute, but suddenly none of that mattered. At that moment, I had a glimmer of what love could mean, and I wanted to hold out for it. I thought to myself– I am done dating. I am done looking for love. I will let it find me. That evening before I headed up to my dorm room to start a new book, I played a few hands of gin rummy with Steve in the lobby of the grad dorm. I told him I was done dating. Done with trying to find love. He nodded like this was reasonable. The next day on the first of our many bike rides out to a small airport where we picnicked, Steve and I agreed to be friends. And, of course, this is how I would finally find love. Through friendship. I have three doorknobs from old Victorian houses. They sit right in front of me near the kitchen bar where I write. An Etsy artist has converted these doorknobs into clocks—and I love them. For me each doorknob represents a house with its rich history and many moments. Here I often pause and think about our moments. Especially at the start of a new year. I had a moment this week—and I bet you did, too. Mine happened after our big Christmas brunch, a long-held family tradition inspired by son’s love of cheesy eggs and bacon—although he no longer eats bacon. But on Christmas Day and for weeks before, I am more Martha than Mary. I clean. I scrub. I bake coffee cake from my mom’s recipe and ice dozens of sugar cookies. Then on Christmas morning my family comes, and there is a flurry of opening gifts, surprises, and the experience is laced with eggnog, coffee cake, and followed with cheesy eggs and potatoes. This year my three grandchildren received a Gingerbread House kit from Santa. After brunch, amid all the chaos and toys, they seized on this gift and headed to their workspace table—my unused dining room. Macy, the seven-year-old, had the two-year-olds in tow. After she ripped open the box and scanned the directions, she carefully doled out the gumdrops to little Stevie and the icing tube to Harper. Macy held tightly to the candies. For over an hour they labored over the gingerbread walls to create designs and decorations that would rival any Jackson Pollack painting. Eventually the sounds of children’s voices called to me like a Siren, and I found myself slipping silently onto a dining room chair where these little cherubs were fully engaged. Even I was in the moment. Three lovely children on Christmas day were playing together. Exuberantly. Even joyfully. 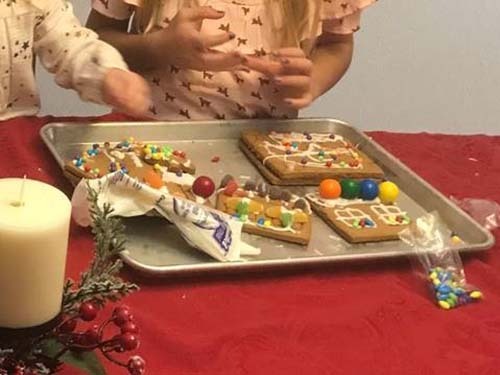 Their fingers were covered with icing and they were eating as much of it as they were using to decorate and glue candies and gumdrops onto the walls of the deconstructed gingerbread house. “Gingerbread cookies,” shouted Stevie, clapping his hands. “Gingerbread Oreos,” Harper corrected him. They squealed with delight. And that was my moment. Children at play. Children in the moment. Children reminding me that laughter, joy, and fixing things together works whether you are seven or seventy years old. In 2019 I am holding tightly to this special memory. Wishing you a new year filled with moments to cherish and share!